When Simon Zebo decided to pack his bags and leave Munster in favour of a move to Racing 92 – his fans were left absolutely devastated. The fullback was always a popular figure in Munster, and remains one to this day, despite the fact they he now plies his trade over Paris. One fan who was particularly gutted when Zebo left Munster was Hanna O’Connell from Kerry. 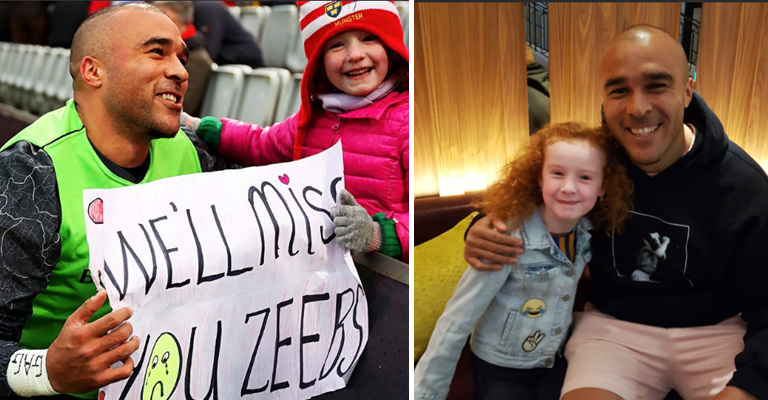 She’s one of Zebo’s biggest fans and went viral back in 2017 after she brought a special sign with her to Thomond Park ahead of his departure. And Zebo hasn’t forgotten about little Hanna. In an incredible act of kindness – the 29-year-old invited Hanna and her mother Marisa to Paris over the weekend for a meet and greet with the Ireland international and a tour of Racing’s incredible Paris La Défense Arena. A truly heartwarming story. Simon Zebo is most definitely one of the good guys. Pure class.